nView's Toteboard wireless keyboard is a 100-key, full-function keyboard that uses infrared technology to communicate with your IBM PC or compatible. 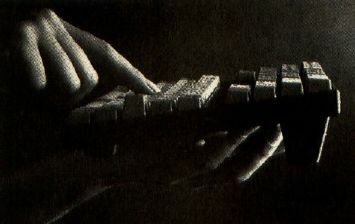 The battery-powered keyboard is approximately half the size of a conventional keyboard and can be operated with one hand. The wireless Toteboard uses infrared transmission for PC communications. A small infrared receiver plugs into the keyboard port and picks up transmissions from Toteboard. The receiver uses a data-verification technique to understand transmissions from wide angles and long or short distances. An optional serial interface is also available. Other features include the ability to use more than one Toteboard to address a single computer, or one Toteboard to control two computers. A Turbo Rep-rate allows you to select IBM's standard key-repeat speed or an accelerated key repeat. The suggested retail price of Tote-board is $495. The keyboard operates on four standard AA batteries. An automatic sleep mode extends battery life for six months to a year.